Himachal Pradesh govt. 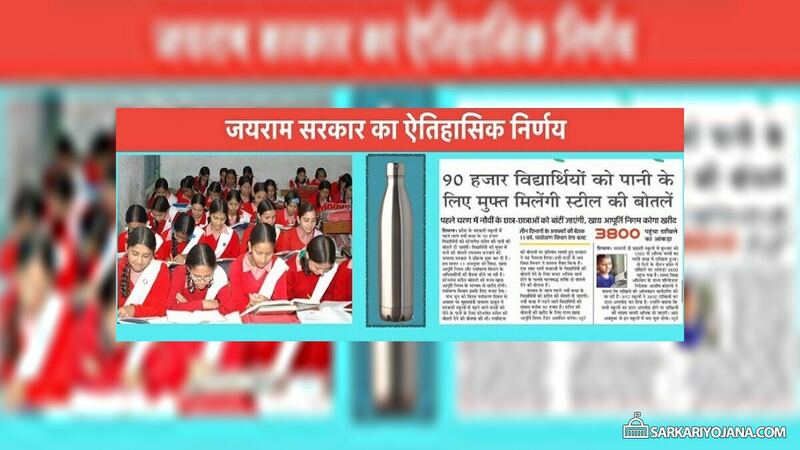 is going to provide free stainless steel water bottles to 90,000 govt. school students studying in class 9th in the state. This decision will discourage the usage of plastic bottles as the state govt. has imposed ban on the plastic items, thermocol plates, polythene & glasses. The initiative will be funded under Mukhya Mantri Vardi Yojana – free school uniform scheme. HP govt. has initiated the process of distribution of steel water bottles to IX class govt. school students. On 11 October 2018, CM will attend a high level meeting comprising of the officials of education, dept. of food & public distribution and dept. of environment. Govt. will purchase stainless steel water bottles through the medium of dept. of food and public distribution and environment dept. will allocate budget. CM has made this announcement to distribute free steel water bottles on 5 June 2018 at the occasion of World Environment Day. CM Jai Ram Thakur announced that free stainless steel water bottles would be provided to around 90,000 class IX students in govt. schools to discourage the use of plastic bottles. This decision is in accordance with the recent Himachal Pradesh plastic ban notification which impose ban on plastic bags, polythene, thermocol plates and plastic made glasses as these materials causes pollution. The state govt. has also banned plastic water bottles of less than one-litre capacity at official functions. The state govt. has realized the severity of plastic bag usage in daily life and how it contributed in polluting the environment. The current water crisis has its roots in the usage of plastic and its discriminate dumping in rivers. This distribution of steel water bottles will ensure that plastic and thermocol usage is reduced which in turn would lead to reduction in pollution. This decision to provide free steel water bottles for 90k govt. school students will be implemented in phases. In the first phase, only class 9th students would be covered which would be extended to other classes in later phases. In the next phases, govt. will cover the students of other classes as well and dept. of education is preparing a proposal for that purpose. Department of food and public distribution will invite tenders for the purchase of stainless steel bottles. There is a proposal to set up 10 solid waste management plants for scientific disposal of waste. A polythene shredder machine will also be installed in Sundernagar and Ghumarwin town. Recently, there was a severe shortage of water in Shimla due to pollution and degradation of water catchment areas, rivers and water bodies. So, pollution reducing plants would be developed in state nurseries and will be provided to the people for plantation. CM Jairam Thakur has also requested tourists visiting the state to use jute or paper bags instead of polythene bags.